Here are my 5 Fabulous Wine of the Month Clubs that I have found and what they offer. There’s something for everyone – for the person just getting into wines all the way to the person with their very own wine vault. Yes, they do exist! Who knew? Here are the different Wine of the Month Clubs that are available. Let’s start with the oldest: The Original Wine of The Month Club. The owner is Paul Kalemkiarian who is the son of the original founder. What is really awesome about Paul is that he guarantees every order you place with him. If you don’t like the wine for any reason, Paul will refund it or replace it, no questions asked. Now that is customer service! With each shipment, Paul educates you about the wine – it is like having your own personal Sommelier. He only selects wines that he would share with his family and friends. He wants you to feel like part of the family – he does a good job too! Classic Series: This is the original club that started this whole crazy movement! 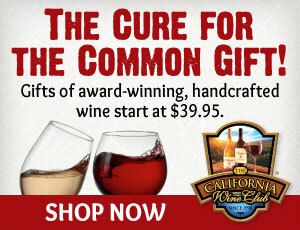 The Classic Series costs $21.95 per month for two bottles of wine – excellent price for two great bottles of wine! A standard shipment will be both one white and one red. You can specify if you would like all reds or all whites. California Series: This only has delicious California Red Wine and is $26.95 per month for two bottles. Vintners Series: This is the club for wine lovers as it showcases wine from all over the world – the best in each region. The Vinters Series costs $31.95 per month for two bottles of wine. This comes with both one white and one red, or you have just reds or whites as well. Limited Series: These wines are the ones you break out for Holidays and Anniversaries or other special occasions. For $41.95 you get a red and white, or just reds or whites. Cellar Series: Every other month receive 6 Classic Series wines, includes 4 reds and 2 whites for $65.95, that’s $10.99 a bottle! The California Wine Club is a family-owned business and the owners are Bruce and Pam Boring. I had the privilege of meeting Pam this past fall and heard how they took their love of California wines and made it into a thriving business. They pick each bottle of wine that they want to share and stand behind those choices. If you don’t love the love the wine whether it was bad, broken, or just not your thing, they will replace it. They have a beautiful monthly newsletter, Uncorked, which is full of information about the vineyard, pairing information, and some pretty fantastic tasting recipes. Another thing to note about the California Wine Club is that you can choose either one white and one red, or all white and all red. If you do, just know that they will be two of the same bottle. I don’t mind that as I often wished I had a second bottle! Premier Series: This is the most popular series as these wines come from small boutique winemakers that typically only sell at their wineries. It is $39.95 per month and you can select monthly, every other month or even quarterly. Signature Series: These are the highest rated and most coveted of California’s wine. Most have won medals and are 90+ points, meaning they are stellar wines. Each month features 2-4 artisan wineries, predominantly red with an occasional white. The price varies each month depending on the wines featured. The average for two bottles is $135 and 3-4 bottles is between $175 and $275. International Series: A different winery from around the world is featured each month. The wines have been hand selected and imported directly. These are mostly reds and it is $71 per month. Aged Cabernet Series: These are killer cabs coming from Napa Valley and have been aged 8-12 years. This is $197 per month. Pacific Northwest Series: Hand selected wines from small family wineries in Oregon and Washington. For $77 per month, you can have a red and white, all reds or all whites. The Gold Medal Wine Club started in 1992 and samples wines from small boutique wineries in California and around the world. Their wines typically can be found winning awards in Wine Spectator, Wine Enthusiast, and Wine & Spirits. All of their wines also receive an 88+ rating. 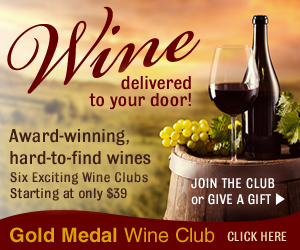 Gold Medal Wine Club prides themselves on bringing you fantastic prices and some pretty fantastic wines. You can choose to have them come monthly, every other month or quarterly. Red only is also a great option. Gold Series: The best from family-owned California wineries. Two wines – 1 red and 1 white for $37-39 per month. Platinum Series: These are ultra premium, 90+ rated California wines. 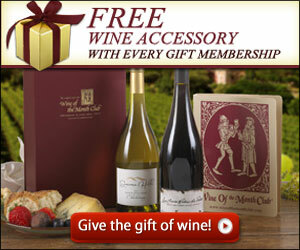 Receive two different wines each months for $89-99. Garagiste Series: This series is for those looking for wines before they’ve been discovered and are created in tiny batches by independent winemakers. It is $49-77 for 2-4 bottles per month. Pinot Noir Series: Two different top-quality pinots from California and International winemakers for $65-75 per month. International Series: Ultra-premium wines from great, hidden wine country estates. Shipments are quarterly from a different country with three specially selected International wines (2 reds, 1 white) for $75-85. Diamond Series: This series is capped to only 500 people and is for those that want really rare wines and is $165-195 per shipment. Plonk Wine Club is a female-owned company with Sommelier Etty Lewensztain at the helm. Plonk not only brings handcrafted artisanal wines to you but often features natural wines including those that are grown using organic or with biodynamic methods. You know that caught my attention! You can get either 2 or 4 bottles of wine or a full case – you choose! Mixed Wine Club: Small batch wine from boutique wineries – 1 red and 1 white for $49.99. I wrote my first #WineWednesday post on Naked Wines: #WineWednesday Let’s Get Naked. NakedWines Club is a little bit different than the others. With most clubs they choose which wines to send to you each month. With NakedWines, you are in the driver seat and can pick the ones you want to try. With NakedWines, you invest $40 a month into your wine account and then purchase whenever you need wine. You are an Angel Investor in a small winery that without your help might not be able to bring their wines to market. Pretty cool if you ask me! NakedWines sells retail, but the best deal is the Angel Club. So when you go to select your wines, you will see both the retail and the Angel price. Just note that these are not 2 or 4 bottles, but half or full cases – which you can mix and match to your heart’s content. Shipping is $9.99 and free for orders over $100. Would you like a $100 off Voucher that is good on orders $160+ of 6 or more 750ml Bottles of Wine for first time customers. That’s pretty awesome right? I really love that $100 off an order of $160 or more. Hoping to take advantage of that soon! Forgot to mention I am a die hard cabernet sauvignon girl! Seriously, great post. This saved a ton of time and was exactly the kind of gift I was looking for to give the sis & brother-in-law. Thanks for sharing the information on wine clubs.